This article mostly applies to the 9 point autofocus system of the Canon 60D and the Rebels including the T5i / 700D and T4i / EOS 650D (and their predecessors), as well as to the new Canon 6D and its 11 AF points. The Canon EOS 7D also shares the same Autofocus Modes discussed below, but it adds Autofocus Area Modes to the mix as well as additional Custom Functions affecting the AF system, so I will have to address those additional capabilities in the future (or you can learn all about them now in my Canon 7D Experience e-book). I have written a separate post that addresses the AF system of the Canon 5D Mark III. 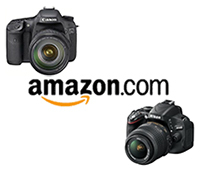 You can learn much more about using these cameras with my Full Stop e-book camera guides for Canon dSLR cameras. One of the essential steps in taking a successful photo is controlling where the camera focuses. If you allow the camera to auto focus by choosing its own focus point(s), it typically focuses on the closest object. This may or may not be what you want to focus on, so you should select where the camera focuses using the Auto Focus Points. This does not mean you have to manually focus the camera, it means you tell the camera exactly where to autofocus. For example, you often want to focus on a subject’s eyes, but if you allow the camera to choose the autofocus point itself, it may select another part of the face, or somewhere else on the body, or even a raised hand that is nearer to the camera than the face to focus most sharply on. If you are capturing an image of a bird in a tree, the camera has no idea you want the autofocus system to zero-in on the bird so that it is in sharp focus and not the branches or leaves near it, or the leaves closest to you. Autofocus works by looking for contrast, so try to focus (place your AF Point) on a detail with a strong line or strong contrast between light and dark. It may not be able to focus on a large area of consistent color – such as a white wall or blue sky or even an evenly colored and lit shirt – or on a subject that is too dark. It can be disrupted by regular patterns or confused when looking through close objects to objects farther away, such as looking through a fence. And it sometimes fails to work as well in dim light, though the AF-Assist Beam can assist in this situation. When photographing people, always try to focus somewhere on the face, ideally on the eyes or eyebrows, then recompose the framing of your image if necessary. Select an Auto Focus Point, or AF Point, using the Multi-Controller or using the AF Point Selection Button and the Cross Keys (depending on your camera). If you have a model with the Multi-Controller (such as the 60D with the thumb-pad or the 7D or 5DII with the thumb-joystick), be sure to set the Custom Function setting for AF Point Selection Method so that you can directly change the AF Point without pressing the AF Button first. • Tap the Shutter Button with a half-press to wake up the camera. • Looking through the viewfinder, use the Multi-Controller or Cross Keys to select the focus point that is nearest to where you want to focus. • Place that point over your intended subject. • Press and hold the Shutter Button halfway down and see that point blink red. The Focus Confirmation Light should light up in your viewfinder. You have locked the focus. • Keeping the Shutter Button pressed halfway, recompose if necessary, and take the shot by fully pressing the Shutter Button. There are reasons to use the outer focus points and not just the center one all the time. First, if you are taking several shots of the same subject and framing, you will not have to re-focus with the center point and recompose between each shot. And by controlling exactly where you focus, you then have greater, more precise control over the use of dramatic depth of field. Also, if you use the center point and recompose, you have swept the camera in an arc to recompose, and are thus always focusing at a distance behind the subject (think of an arc that is your focus distance, and the tangent line off that arc that is the focus plane which now runs behind the subject after re-composing). This may not be as noticeable when the subject is further away, but for a close subject – especially when using shallow depth of field – the difference is critical. It may sound difficult to select the focus point each time, but it is actually very quickly done and should become instinctive. You may even start to set your focus point as you approach a scene before even bringing your camera to your eye. The 60D and T3i (and 5D/ 5DII and 7D) have different focus modes to choose from, typically depending if your subject is still or moving, or if you wish to track its movement. Use this mode when your subject is still and not going to move, or if your subject is not going to move very much, or if the distance between you and the subject is not going to change between the time you lock focus, recompose, and take the shot. Lock focus on the subject and recompose if necessary. This mode can even be used for moving people or objects if you quickly take the shot after establishing or locking focus. Focus on your subject by pressing the Shutter Button halfway. The active or selected AF Point will be displayed or will illuminate, and the Focus Confirmation Light at the lower right in the Viewfinder will illuminate as well. Continue to press the Shutter Button all the way to take the shot. If you half-press the Shutter Button to lock focus on your subject, the camera will remain focused at that distance as long as you keep half-pressing the Shutter Button. You can recompose the shot as you wish and then full press the Shutter Button to take the photo. As just noted, if the Focus Confirmation Light does not light up and the camera does not take the photo, the camera may not be finding enough contrast to focus on, you may be too close to your subject for the lens to focus, or the lighting may be too dim for the AF system to work properly. However, if you are photographing a subject that is approaching or receding from view at a relatively constant rate, or photographing fast or erratic or unpredictably moving subjects, or photographing sports, action, or wildlife you will usually want to use AI Servo Focus Mode. AI Servo mode is used for tracking and focusing on moving subjects, and is ideal for capturing sports and wildlife including birds. If the subject is moving towards you or away from you the camera will keep evaluating the focus distance as long as the subject remains under the focus point that was originally active and the Shutter Button is kept half-pressed, and if the subject is moving from side to side or throughout the frame the camera will track it as it passes from one AF Point or Zone to the other ones (if you started tracking with the center AF point on the 60D and T3i or any selected AF point with the 7D). If the subject is going to be moving across your field of view, set the camera to automatically select the focus point using all the AF points (this is one of the few times you will not be manually selecting the auto focus point), focus on the moving subject with the center focus point, and then as long as the Shutter Button remains half-pressed the camera will track the subject to the other focus points if it moves to them. Thus when the image is taken, the subject is in focus. This will even work in conjunction with continuous shooting. If you keep the Shutter Button fully pressed and continue to take photos, the camera will keep focusing on the moving subject. As you can imagine, this is ideal for tracking a player running across a field, a dog running toward you, or a bird moving across the fame. Note that when shooting with Continuous Shooting Drive Mode not every shot may be in sharp focus as the camera sometimes can’t keep up and accurately predict the subject’s speed or location. But you should be able to capture many sharp images with this technique. The more sophisticated Canon 7D will allow you to start tracking moving subjects with any selected AF Point and not just the center AF Point. These are the types of advanced capabilities you are paying for (and should take advantage of!) with a more expensive dSLR. As you will see, when using AI Servo mode your compositions will be partially dictated by the positions of the autofocus points in your Viewfinder. The subject needs to be at one of these AF Points in order for the camera to maintain focus on it. This is why in some situations becoming skilled at quickly using One-Shot AF – even for action scenes – will give you much more ability to control your compositions. This mode is a hybrid of the two other focus modes. It starts in One-Shot AF mode then changes to AI Servo mode if your subject starts moving. Why shouldn’t you use this all the time, then? Well, it is typically not the best of both worlds. If you are focusing and then recomposing, as you may often be doing, your movement of the camera may fool it into thinking that the subject is moving and then activate subject tracking AI Servo Mode, and your resulting focus may not be where you intend it to be or may not be as accurate as it could have been with One-Shot AF. And in AI Focus Mode it may not be as quick to respond to a moving subject as it would in AI Servo Mode. Typically you know if your subject is still or moving so it is better to select one of the other two AF Modes. Plus that way you always know which AF Mode you are working in and can either lock focus where you want it or begin tracking a subject without wondering what mode the camera is in and if it will suddenly change. But there may be situations that call for this combination mode such as a still bird or animal that may start moving unexpectedly, so keep it in mind. Remember that One-Shot AF just focuses once and doesn’t change once you lock it in, and AI Servo AF is the other extreme – continuous focus used for moving objects. And AI Focus AF is listed in the middle, between the two, because it is the hybrid, combination of the two. You can review your images on the rear LCD Monitor of your camera to try to determine if they are in focus, especially by zooming in as close as possible. But be aware that this screen has only about one million dots or pixels, while your actual image has about 18 million pixels. That means that many images will appear to be in proper focus on your LCD screen, but you might discover that the actual images are not really so sharply in focus. Before continuing, I want to mention that much of this text is excerpted from my dSLR guides for the Canon EOS 6D, Canon 70D, Rebel T5i / EOS 700D, Rebel T4i / EOS 650D, and the Canon EOS 7D. If you would like to learn more about the autofocus systems as well as all the other features of your camera including metering modes, Aperture and Shutter priority modes (Av and Tv), all the menus and Custom Function settings, and more, have a look at my Full Stop e-book camera guides. In addition to explaining the features and settings, the guides clearly explain when and why to use them in order to capture the images you desire. What do you do when, with your desired framing, your subject is not located exactly under or near an AF point? Even with the 19 or 39 points of an advanced Canon 7D or Nikon D7000, this will often be an issue. For example in Figure 2 above, I actually wish to capture the entire window and more space around it within the image frame, but moving the camera and framing for that composition leaves me with no AF Point at the woman where I wish to focus. Have a look at the above post to learn why this is an issue and how to resolve it. Many functions of dSLR cameras are related to some degree or another, and Focus and Depth of Field are two of these. The depth of field, based on your aperture setting (and thus related to exposure…) expands forward and back from your point of focus. Thus, one important aspect of controlling your depth of field begins with focusing exactly where you want to. To begin learning more about depth of field, have a look at my post Depth of Field Simplified. In discussing AI Servo mode for the T3i, you say to enable all of the focus points and to use the center point to focus on the subject (so the camera will keep the subject in focus as it moves across the other focus points). But if there are closer objects than the subject, won’t the camera automatically select a focus point near such an object instead of letting me focus on my subject in the center? That is a good question. When working in AI Servo Mode and Automatic AF Point selection, however, the camera will indeed use the center point only to look for the subject and initiate autofocus and subject tracking. Then if the subject moves to the other AF Points they will continue to track it. When working in One Shot AF and Automatic AF Point selection, the camera will look for the closest subject using all the AF points. I will be sure to point out that difference in my future explanations. solve the problem then what’s the point. Any help is much appreciated. I don’t think that statement would be true of any specific camera, as the sensor itself doesn’t care what aperture setting is being used – in other words, lack of sharpness at a wide aperture would be a characteristic of a specific lens, not of any specific camera or sensor. You should inform that commenter that they are…well…misinformed! Are you experiencing back- or front-focusing issues at the wide apertures, or basic all-around lack of sharpness? While I don’t believe the 60D has AF Micro-adjustment, you could possibly manually compensate for back/ front focus issues. Or if the online samples show that your lens should be performing better, you could send the camera and lens to Canon for adjustment. They might need to go together, as each camera and each lens is uniquely “off,” and you will want to make sure they work well as a pair. But first ensure that you have control of the AF system and that the camera is focusing where and how you want it to, as explained in the article above. Also note that if you are shooting in RAW, you will need to sharpen the images in post-processing in order to see the best results.